Our search can be so polluted with personal motives that instead of finding Jesus, we find our own reflection staring back at us. I think many people make Jesus into who they want him to be. Why? Is it so they can use his authority to justify their own way of life? Is it so they won’t be required to change? Is my own perspective also tainted? I’m sure it is. But I think that when it comes to better understanding Jesus, we are led much close to the truth when we look at who we actually find in the Bible. Archaeology, culture and language studies, tradition and reason, can also help us with our understanding, especially when they deepen our reading of the Bible. Not really. He was Jewish. He was fully immersed in the Hebrew Bible, attended synagogue, went through Jewish customs like circumcision and pilgrimage to Jerusalem. The list goes on. But to just end there is also a bit misleading. Many people, including Jesus, understood him to be the long-awaited Messiah—a word that means the same as Christ, i.e. “anointed one.” The Messiah was a rescuing figure who represented God on earth. A divine ambassador. So why are Judaism and Christianity separate religions? Well, I’m seriously condensing here, but one of the things that happened was that those who believed Jesus was the Messiah (Messiah-ians, or “Christ-ians” as they were later called) started worshiping together on Sunday (the day he had been resurrected), and those who didn’t continued worshiping at the synagogue on Saturday. The implications of believing Jesus to be the Messiah proved too big for them to pretend they had no significant theological differences. So Christianity is kind of like the younger sibling of Judaism. So was Jesus a Christian? No. But also kind of yes. He was a Jew who understood himself as someone the Scriptures pointed to, and as the Jewish Messiah: God’s anointed ambassador on earth. It can be argued that modern Christians are living out a certain understanding of Judaism in light of how their Messiah calls them to live. Jesus identified himself as one with God. As it says in one of the earliest Christian statements of faith: “Jesus is Lord.” In historical context, many said that “Caesar is Lord.” So it was a radical (and sometimes dangerous) thing to say about a Galilean man from seemingly humble origins who performed miracles, taught with an authority that exceeded Moses, and was crucified as a subversive. I feel I gotta share a bit of a conversation between U2’s Bono and interviewer Michka Assayas. Religion is an easy, convenient and popular target. But I don’t think Jesus disliked religion. If he did why did he live so faithfully as a synagogue-going, Bible-teaching, justice-seeking Jew all his life? What is more accurate is that Jesus disliked certain abuses of his religion. And the Gospels are full of examples of him drawing people back to the truer way, often to hostile opponents. Faith being about a relationship more than rules was central to his teaching. It was also about God’s kingdom come—his will be done on earth as it is in heaven. That’s good. And it has huge implications for how his followers are to live on earth. His God-worshiping, truth-proclaiming, forgiveness-asking, justice-seeking, people-serving, joy-bearing followers. The part about him “simply teaching love,” is also misleading. Yes he loved incredibly. But that wasn’t his religion. He was a Jew—who worshiped and served not some abstract deity or universe, but the one true God of Israel who decisively acted in history through Abraham and Sarah, Moses, Rahab and a young girl named Mary. He was a Jew who understood his Judaism in a certain way. He would have most likely said the Shema twice daily; and he knew the commandments and stressed the greatest command to love God and neighbour with every inch of our being. But he also helped define that love. To say “God is love” is an empty statement if we’re unclear about what love is. If we think it’s a warm fuzzy idea where anything-goes-if-our-hearts-are-in-the-right-place we are wildly off the mark. Jesus loved, but he also called for people to change, to stop sinning, to be who God made them to be. And he did so dramatically and without apology. This often came (and comes) with great sacrifice—but also a renewing joy. This is a tricky one. I believe that Jesus loves you. And I believe that he loves you just the way you are. But his love doesn’t end there. If you’re new to the Christian faith, the passage I’m about to quote might seem harsh: “When Christ calls a man, he bids him come and die.” This is how Dietrich Bonhoeffer said it. 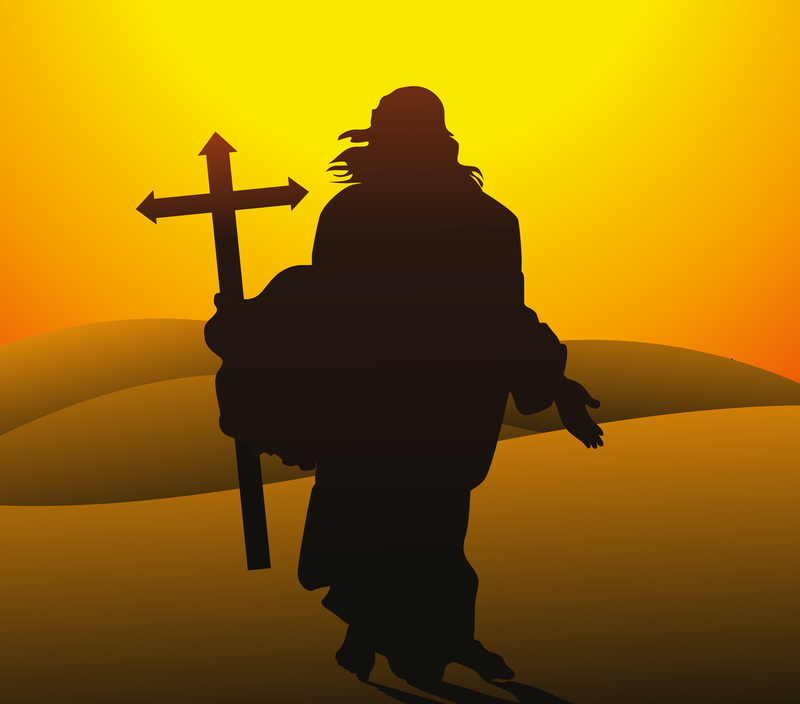 When speaking to his disciples, Jesus said: “If anyone would come after me, he must deny himself and take up his cross and follow me” (Mark 8:34). (FYI, a cross was like the ancient equivalent of the electric chair.) I don’t think he expected us to all physically die on the spot; but when we follow him we are called (i.e. divinely summoned) to die to our old life, and become a new creation. In Jesus you are an upward trajectory of love into infinity. But we’ve often made Jesus into a positive-thinking, light skinned, long-robed hippie. As professor Tom Long says, much Christian preaching and teaching comes across as if Jesus came and died to give us quiet time. I’m not perfect. I have such a long way to go! And I know that it’s tempting to fashion a Jesus who doesn’t want me to grow any more, and who readily blesses the status quo. Today you get hit with a hammer less if you fit in instead of standing out. But for those of us who try to follow Jesus, growing into the people he wants us to be as we partner with him to re-create the world, always fitting in isn’t a faithful option. “I think the best method is to convince people that there is no God,” said the youngest of the recruits. “Perhaps we could convince people that there is no hell,” a second recruit suggested. “Then what is the best method of deception,” the recruits all asked eagerly. “Our best method works with those who go to church regularly as well as those who do not. We call it ‘Moderation.’ We convince people not to get too excited or fanatical about God. This way they convince themselves they are believers though in truth there is no fire in the soul. ‘Moderation’ works just about every time. The Cost of Discipleship forever changed my faith and my own strong footing in moderation. Loved seeing Bonhoeffer quoted here.